﻿Evaluate schema theory with reference to research studies A schema is a cognitive structure that provides a framework for organizing information about the world, events, people and actions. According to the British psychologist Ferderic Bartlett, he defines schema in short as a mental representation of knowledge. 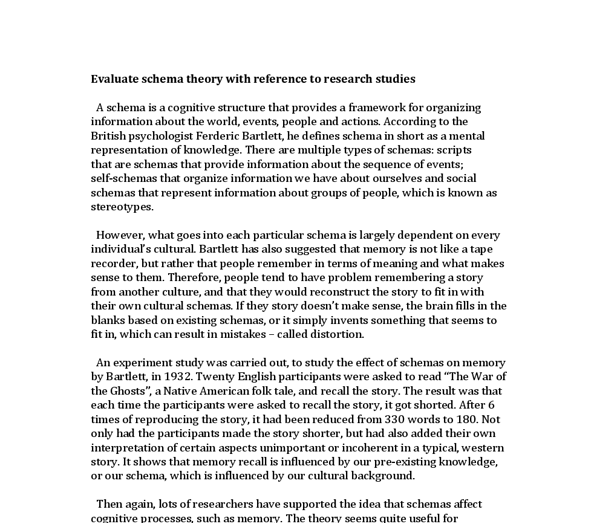 There are multiple types of schemas: scripts that are schemas that provide information about the sequence of events; self-schemas that organize information we have about ourselves and social schemas that represent information about groups of people, which is known as stereotypes. However, what goes into each particular schema is largely dependent on every individual?s cultural. Bartlett has also suggested that memory is not like a tape recorder, but rather that people remember in terms of meaning and what makes sense to them. Therefore, people tend to have problem remembering a story from another culture, and that they would reconstruct the story to fit in with their own cultural schemas. If they story doesn?t make sense, the brain fills in the blanks based on existing schemas, or it simply invents something that seems to fit in, which can result in mistakes ? called distortion. ...read more. It shows that something you remember begins as environmental stimuli and is then passed on as sensory memory. If the person is focusing on it or if it is believed to be important, it is passed on to the Short-term memory with its duration of 6-12 seconds. It is only through rehearsal that information can be moved to the Long-term memory. Once stored in the Long-term memory, the information can be retrieved and passed back to the short-term memory and then back again. The MSMM allowed most of the development on memory research and it outlines a very basic structure of the memory systems that other research has only develop. Besides, with the evidence of the case study of HM, the model shows the distinction between STM and LTM. Some patients have problems with STM but not LTM, and some may have problems with LTM but not STM. It also tells that encoding is different in both memory stores. In STM memory is encoded acoustically while in LTM, memory is encoded semantically. Then again, with the development in technology and in psychology it has been shown that although the model?s main claim is still accepted the model gives a very simplistic view of how the memory works and is largely wrong at some points. ...read more. When Participants were asked to recall, they recalled more words that were semantically processed compared to phonemically and visually processed words. This experiment proves that semantically processed words involve elaboration rehearsal and deep processing which results in more accurate recall. The theory is an improvement on Atkinson and Shiffirin?s account of transfer from STM and LTM. The levels of processing model change the direction of memory research. It shows that encoding was not simple, straightforward process. This widened the focus from seeing long-term memory as a simple storage unit to seeing it as a complex processing system. Besides, this explanatin of memory is useful in everyday life because it highlights the way in which elaboration, which requires deeper processing of information, can aid memory. Then again, despite these strengths, there are a number of criticisms of the levels of processing theory. It does not explain how the deeper processing result in better memories. Eysenck (1990) claims that the levels of processing theory describes rather than explains. Deeper processing takes more effort than shallow processing and it could be this, rather than the depth of processing that makes it more likely people will remember something. Lastly, the concept of depth is vague and cannot be observed. Therefore, it cannot be objectively measured. ...read more. This student written piece of work is one of many that can be found in our International Baccalaureate Psychology section. Testing the effect of different types of music on memory. National Undergraduate Research Clearinghouse, 3. Available online at http://www.webclearinghouse.net/volume/. Retrieved May 29, 2011. Haralambos M., Rice, D., Foreman, N., Jones, S., Stenner, P., Brown, S., Sharp, K. (2002). Psychology in Focus. Thomspon, D.M., & Tulving, E. (1970). Associative encoding and retrieval: Weak and strong cues. Then the instructions, as shown following, were read to them. Instructions read- 'This experiment is two trialed. For both trials, you will be presented with the same list of twenty two words, which you should try to memorize within sixty seconds. how did Freud's life affect his theories? satisfy the Id's basic urges within the constraints of the Super ego. The Super ego contains our values and social morals, which often come from the rules of right and wrong that we learned in childhood from our parents and are contained in the conscience. The study will be performed will use Bower's study as a guide but will be giving different words to the subjects. Null (Directional) hypothesis (H�): there will be no statistical difference between the recall of words, by 16-18 year old higher education students shown an organised hierarchy of words. Engagement in such a tension-relieving activity during this early stage serves as the prototype for relationships that develop later on in life. Life-stage-related changes in stress, tension, and needs are based on the outcome of such coping attempts formed during infancy. Bartlett found some characteristic changes in the reproduction of the story, such as it was shorter and more conventional to the participant's (story teller's) background and past experiences. From this, Bartlett concluded that people reconstruct the past by trying to fit it into existing schemas. 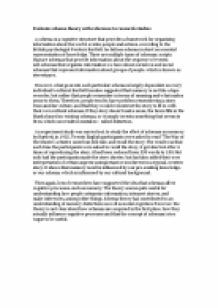 This essay will evaluate flashbulb memory on how emotion can affect cognitive process.